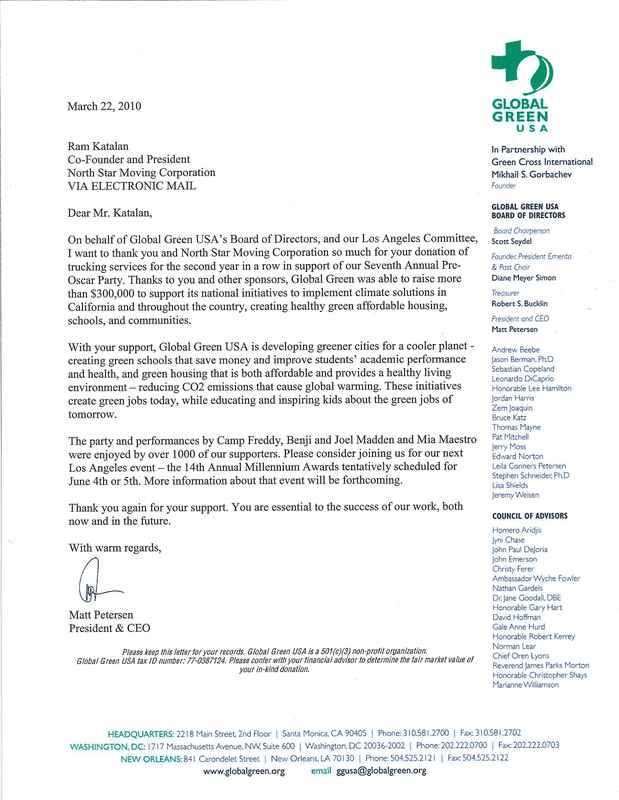 On behalf of Global Green USA’s Board of Directors, and our Los Angeles Committee, I want to thank you and North Star Moving Corporation so much for your donation of trucking services for the second year in a row in support of our Seventh Annual Pre-Oscar Party. Thanks to you and other sponsors, Global Green was able to raise more than $300,000 to support its national initiatives to implement climate solutions in California and throughout the country, creating healthy green affordable housing, schools, and communities. With your support, Global Green USA is developing greener cities for a cooler planet -creating green schools that save money and improve students’ academic performance and health, and green housing that is both affordable and provides a healthy living environment – reducing CO2 emissions that cause global warming. These initiatives create green jobs today, while educating and inspiring kids about the green jobs of tomorrow. The party and performances by Camp Freddy, Benji and Joel Madden and Mia Maestro were enjoyed by over 1000 of our supporters. Please consider joining us for our next Los Angeles event – the 14th Annual Millennium Awards tentatively scheduled for June 4th or 5th. More information about that event will be forthcoming.